SOUTH BEND, Ind. (AP) — Democrat Pete Buttigieg, the 37-year-old mayor of South Bend, Indiana, is forming an exploratory committee for a 2020 presidential bid, according to a video and email announcement obtained by The Associated Press. "The reality is there's no going back, and there's no such thing as 'again' in the real world. We can't look for greatness in the past," Buttigieg says in a video that includes before-and-after footage of South Bend, a Rust Belt city once described as "dying." How do you pronounce these Democrats' names? "Right now our country needs a fresh start," he says. Buttigieg has touted his work to improve his city of 100,000 residents as he's prepared for an improbable jump from local politics to a presidential campaign. He's also said Democrats could benefit from a new generation of leaders as they try to unseat President Donald Trump in 2020. He's expected to travel to Iowa next week to meet with voters in the nation's first caucus state, followed by stops in New Hampshire. Buttigieg is a Rhodes scholar who was first elected mayor of his hometown in 2011 at age 29 — making him the youngest mayor of a U.S. city with at least 100,000 residents. A lieutenant in the Navy Reserve, he served a tour in Afghanistan in 2014. Buttigieg raised his national profile with an unsuccessful 2017 run for Democratic National Committee chairman, saying the party needed a new start. He withdrew from the race before a vote when it became clear he didn't have the support to win. Buttigieg has spent time in Iowa and other battleground states in recent years as he tried to build financial support and name recognition. He cracks that those who do know his name still aren't sure how to pronounce it. (It's BOO'-tah-juhj.) Most of the time he goes by "Mayor Pete." 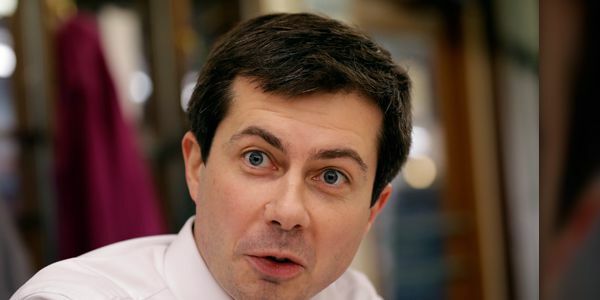 Amid his campaign for a second term, Buttigieg came out as gay in a column in the local newspaper. He went on to win re-election with 80 percent of the vote. In 2018 — three years to the day after the column ran — he married his husband, middle school teacher Chasten Glezman. If he were to win the Democratic nomination, Buttigieg would be the first openly gay presidential nominee from a major political party. Buttigieg announced in December that he wouldn't seek a third term as mayor, stoking speculation he would join a field of roughly two dozen candidates who may seek the Democratic nomination for president — most of them better-known and with experience in higher office, and all of them older. "I belong to a generation that is stepping forward right now," he says in the video released Wednesday. "We're the generation that lived through school shootings, that served in the wars after 9/11, and we're the generation that stands to be the first to make less than our parents unless we do something different. We can't just polish off a system so broken. It is a season for boldness and a focus on the future." Buttigieg is releasing a book in February about his life and his tenure leading South Bend.